Flutist Dr. Ayça Çetin has performed in countries including Bulgaria, England, Italy, Kosovo, Turkey, and throughout the United States. 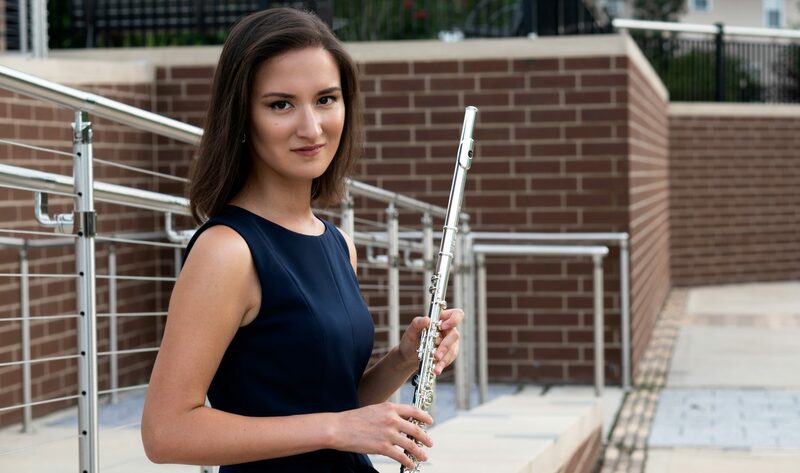 Praised by Leone Buyse, former principal flutist of Boston Symphony Orchestra with “excellent intonation, fine timbral blend, impeccable articulation, brilliant technical command, and very personal musical language,” Dr. Çetin continues to share her passion in performing, commissioning new music, and teaching. An avid soloist and chamber musician, Dr. Çetin has made appearances at prestigious venues such as Carnegie Hall, Boston Symphony Hall, and Istanbul Fulya Sanat Hall. The national and international festivals and conventions she has performed include the International Eskisehir Music Festival, International Mersin Music Festival, The National Flute Association, Kosovo Flute Sounds Festival, British Flute Society, Italy Falaut Festival, Chicago Flute Club, New York Flute Club, and Hot Springs Music Festival. Dr. Çetin is a founding member of Duo Esplanade (flute, clarinet) and Cosmos New Music (flute, clarinet, violin, cello, piano). She recently took Duo Esplanade to Istanbul, Turkey to perform and give flute and clarinet masterclasses. The workshop on new music and improvisation at Carnegie Hall at Resnick Education Wing was one of the highlights in Duo Esplanade’s season 16-17. Along with the ensemble she was broadcasted live on Florida’s WFSQ 91.5-FM. California, Florida, New York, Massachusetts, Michigan, Minneapolis, and Ohio are some of the states she toured as part of the Duo. Her quintet Cosmos New Music’s 2017-2018 season included performances at Carnegie Weill Hall, Boston New Music Gathering, National Flute Association, Central Florida University, Stetson University and Florida A&M University. Shortly after coming to US with an interest towards American culture and musical scene, she has received several awards and prizes, among them: 2015 Boston Woodwind Society Doriot Dwyer Flute Merit Award Competition, 2012 NFA Convention Performers Competition, 2014 NFA Masterclass Performers Competition, and honorable mention award at the Nixon Woodwind Competition in 2012. She was also chosen as one of the finalists of 2015 New York Flute Club Competition. A strong advocate of contemporary and world music, she has worked with Louis Andriessen, Gunther Schuller, David Gillingham, and Libby Larsen, commissioned and premiered several solo and chamber works by Kenji Bunch, Gregory Wanamaker, Roee Ben Sira, David Lipton, Matthew Weaver, Kevin Wilson, Nathan Brown, and Yunus Gencer, among many. Taking part in the Refik’i Rebab Ensemble’s “Ruhnuvaz” concert series for four years, she recorded and released a Turkish music album titled “Subh-u Seher” in 2011. In addition to playing Turkish and Eastern European music in various chamber groups, she was hand-selected to perform alongside virtuoso Greek singer Mario Frangoulis for his 2014 concert season. Presently she is touring as a soloist and chamber musician, performing with regional orchestras including Ocala Symphony Orchestra and Tallahassee Symphony Orchestra while maintaining her flute studio in Tallahassee, FL. A native of Istanbul, Turkey, Dr. Çetin received her degrees from Florida State University, The Boston Conservatory at Berklee, Central Michigan University, and Mimar Sinan Fine Arts University State Conservatory in Istanbul. She had the priviledge to serve as a teaching assistant of Eva Amsler and Joana White during her graduate degrees. Her other primary teachers and mentors are Linda Toote and Vieri Bottazzini. Ayça Çetin is currently a Miyazawa Emerging Artist.